Simpson’s paradox for quantitative data: a positive trend ( blue line and red line ) appears for two separate groups, whereas a negative trend (dotted line) appears when the groups are combined. For these particular sets of graphs, if you look in aggregate the consumer marketing emails had a higher click-through rate, however when you split into the different customer spend buckets, the business emails do better. 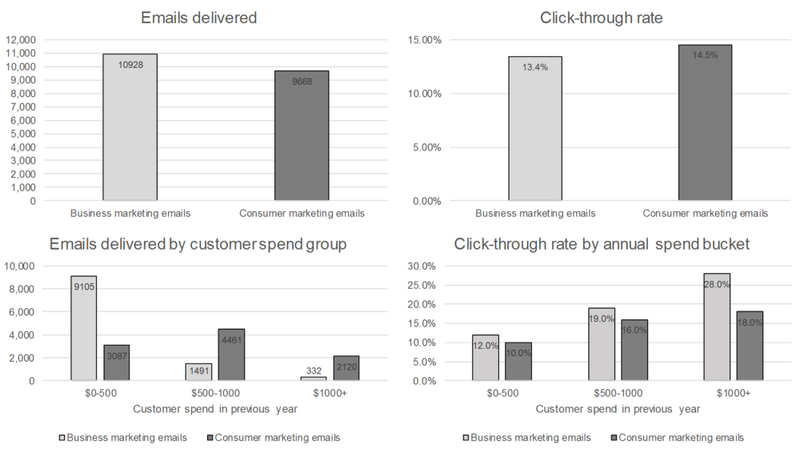 For some reason, most of the business emails went to the low value customers with lower click rates, and so while in aggregate the business emails did worse, when you account for spend they did better. But when examining the individual departments, it appeared that six out of 85 departments were significantly biased against men, whereas only four were significantly biased against women. In fact, the pooled and corrected data showed a “small but statistically significant bias in favor of women.” The data from the six largest departments are listed below.